Global steel giant Tata is stepping up its photovoltaic project in Wales. Tata is in a joint venture with solar cell manufacturer Dyesol to set up the world’s first continuously manufactured dye sensitised photovoltaic product on steel. The £11m project is due to open in Shotton in North Wales in June and this week the companies revealed it will be increasing the workforce from 30 to 50. Peter Strikwerda, managing director of Tata Steel Colors, said: “This project forms a key part of the Tata Steel strategy to develop a new range of functional coated steel products based on renewable energy for use on the roofs and walls of buildings. 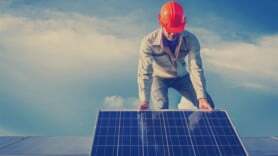 “The project has met the objectives originally set for this phase to determine the photovoltaic cell architecture on steel, the roof component designs, the manufacturing processes and the raw materials requirements.